I’ve been reading dystopian fiction lately and looking forward to the third installment of The Hunger Games: Mockingjay. When neighboring Buffalo was buried in over 70 inches of snow this week, I thought of Cal in the futuristic novel California, whose parents were lost in a massive snowstorm that destroyed Cleveland. And just as I dipped into pandemic-ridden Station Eleven, Ebola was front and center in the news. Reality and fiction are getting too close for comfort. 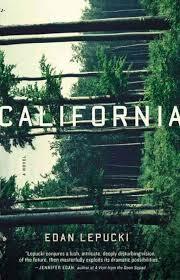 In California by Edan Lepucki, it’s post apocalypse: climate change, inequality, and societal decay on a massive scale have pushed civilization over the edge. The “haves” live in fiercely guarded gated communities, while others band together in communes and cultish groups, and some eke out a living in the wilderness on their own. 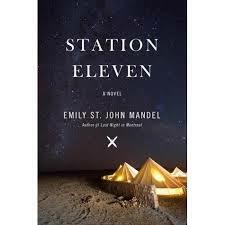 It’s Emily St. John Mandel’s Station Eleven I want to write about here, a National Book Award finalist. Of the two novels, I prefer this one, though both have gotten excellent reviews. In Station Eleven, a flu pandemic kills 99.9 percent of the population in a matter of days. We see the end of advanced civilization through the eyes of five characters, and the first decades after the collapse. What was it in this statement that made Clark want to weep? “Right,” Clark said. He was filled in that moment with an inexpressible longing. Clark, of course, is jolted awake in a very big way when his flight to Toronto is diverted to a small Michigan airport after the pandemic explodes. He and his fellow passengers, untouched by the flu, watch the end of life as they know it on television. They never leave the airport – it becomes their settlement, their home. Eventually, Clark establishes a Museum of Civilization, where people donate iPads and smart phones and other remnants of their now-lost advanced culture. Meanwhile, a roving theater troupe travels from town to town performing classical music and Shakespeare for groups of survivors living in abandoned Walmarts and gas stations. In this troupe are characters we’ve met earlier in the novel. The younger members only dimly remember a world with electricity and and other marvels, and some were born after the collapse. One day, they arrive at Clark’s airport settlement, and there is a poignant reunion of sorts for Clark. Station Eleven, among other things, asks whether art can save and redeem humanity. I can’t help but think of this outpouring of dystopian literature as the proverbial canary in the mine. A wake-up call for those of us who, like the characters in Station Eleven, may need it. Ursula Le Guin, in her stirring National Book Award speech the other night, said we will need more writers who can imagine a different way of being. Six minutes well worth listening to. Redeployment by Phil Klay, a veteran of the Iraq War, won the National Book Award for fiction, so this collection of short stories is on my reading list. I find it really difficult to read dystopian works of fiction these days, the current reality is dystopian enough. Right now I’m doing a historical fiction binge, specifically The Pillars of the Earth by Ken Follett. I’ll be ready for another dystopian work of fiction when I’m feeling a little more optimistic. Well, you are certainly right about the current reality. I don’t like to read dystopian fiction a lot, it is too much and they all start sounding the same. Thanks for stopping by! I can’t wait to read this book!! Clearing my schedule, hope to devour it soon. I think you’ll like it, thanks for stopping by!